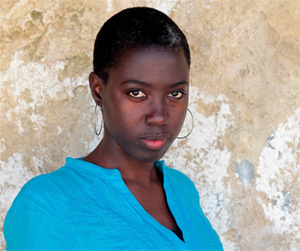 Born in 1979 in Dakar, Angèle Diabang Brenner studied at the Dakar Media Centre, the FEMIS in Paris, the Filmakademie in Germany, and participated in the Eurodoc training program. She began her career as a camera operator and editor before directing, in 2005, her first short documentary My Beautiful Smile, shown in more than fifty festivals. She directed Senegalese Women and Islam in 2007, Yandé Codou, Senghor's griot in 2008, and Dr. Mukwege, the Man Who Saves Women in 2014. In 2006, Diabang created Karoninka, her production company, and produced the short film Jakob by Benjamin M. Gronau (Germany, 2010), the documentary The Rite, the Madwoman and Me by Gentille ASSIH (Togo, 2012), Akpéma by Gentille Assih (Togo, 2011), Waliden, Someone Else's Child by Awa Traore (Mali, 2009), The Monologue of the Mute by Khady Sylla and Charlie Van Damme (Senegal/Belgium, 2007), and Electro For Ever (France, 2008), which was directed by students of the School of Electronics in France. Congo: The Doctor Who Saves Women - Dr. Denis Mukwege was nominated for the Nobel Peace Prize for helping over 40,000 women raped during 20 years of conflict in eastern Democratic Republic of Congo.